What happened, when a boy with stage fright received a guitar as a gift and overcame his fears? How did a disobedient girl in a bus start a battle for human rights? Who were the first creatures on the dark side of the Moon? Moments Before the World Changed makes us see how everyone can have an effect on the course of this world. It is a book about crucial, important acts, realisations and standpoints, that have preceded historic turns of events and pushed change into motion. It tells the unknown stories behind the familiar stories. 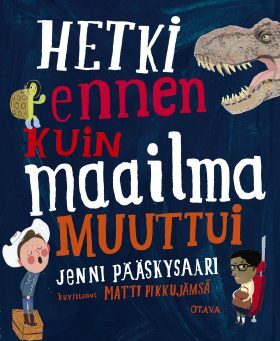 Bedtime story length recollections of carefully researched events and characters from history, written by experienced journalist Jenni Pääskysaari and illustrated by popular artist Matti Pikkujämsä.